AUTOMATICA 2018: Cobots and Grippers Rule! Editor’s note: Herr Hägele has just detailed the entire thesis behind The Gripper Chronicles. Had I known that he had made such a wonderful remark, I would have bought him dinner at Andy’s Krablergarten on Thalkirchner Strasse. Maybe the Bavarian roast duck with potato dumplings, blaukraut…and a mug or two of Rauchbier. One of the most compelling takeaways from AUTOMATICA 2018 (June 19-22) has got to be the emergence of cobot grippers going through a new phase in their evolution, which lately has been rapid…and eye popping. The Gripper Chronicles is our way of isolating and looking closely at the fascinating technology taking place at the end of every robot and cobot’s arm. With so many cobots and cobot grippers co-located in one place, as they were at AUTOMATICA, the overwhelming impression is that the industrial robot is quickly getting crowded out by the industrial cobot. Seems the cobot world is taking over. If you were a cobot at AUTOMATICA 2018, there was a host of slick-looking, new-age grippers waiting to snap onto your wrist. If a non-cobot, AUTOMATICA 2018 was much like a ditto of AUTOMATICA 2016…or even 2014. In some respects, non-cobots almost don’t count any longer. Sure, the big bruisers will always be important for the heavy-duty aspects of manufacturing and logistics…but cobots are rushing in to take on all the skill positions, just like their human counterparts. The data definitely bear out the cobot influence that’s taking shape. The International Federation of Robotics (IFR) reported that industrial robot sales increased 29 percent in 2017. However, cobot sales increased by more than 50 percent. 434k a year! Yikes. That’s a staggering number. It beats out by 50k the IFR’s total for all industrial robots shipped for all of 2017 (380,550 in 2017). In China, cobot “sales are set to see a massive jump…as more industrial manufacturers deploy them to assist their human work force,” reports the Blue Paper of the Cobots Industry for 2017; “the total size of the market in China will exceed $196 million by 2020. As many as 2,300 cobots were sold in China last year, up 109.09 percent year-on-year, and the market size rose 83.89 percent to $55 million,” the report added. 2300! Truly, a pittance for what could be. With China’s more than two million factories awaiting automation, and with only 2300 cobots sold, cobot sales could go ballistic very quickly. No doubt Asian attendees took gigabytes of smartphone snaps and sent them hurtling back east. 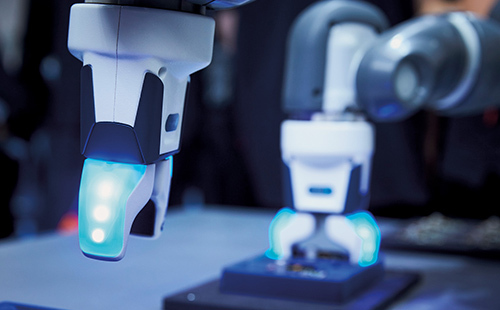 No doubt as well, attendees, regardless of their place of origin, could readily sense a cobot-dominated manufacturing and logistics world winging its way forward, and cobot gripper manufacturers getting ready to serve it. First off, and very noticeably, at the end of a cobot’s arm there’s a building boom going on. Structures are being built. Slick-looking product design is taking place where once, just a few short years ago, you’d find only a pair of bare, pincer-like fingers or blades sticking out. Now there are sleek metal or plastic cowlings going up, inside of which are all manner of sensors, chips, communications, computing, and, in some cases, even teeny LCD screens. The aforementioned pincers and blades are still there, so too are magnets and suction cups. In fact, even the pincers and blades are evolving: some have tactile sensors, some polyskin, some bio-inspired tentacles, and all are getting smart at what they touch, turn and carry; probably due to the electronic goodies under all those sleek, curvilinear cowlings. It’s like the gripper community en masse had sought out and hired Ideo’s “design thinking” team to brainstorm a bit at making cobot grippers more appealing to co-working humans…and buyers. Mission accomplished: The grippers look very cool…as well as perform at a high level, getting higher by the day. Of course, artificial intelligence has only just begun to infuse itself into cobot grippers; edge computing, plus a synergistic joining of IT and OT will also swirl in to upgrade product development and productivity. Like new models of automobiles, look for grippers to frequently roll out new versions of themselves as more advanced tech settles in under their cowlings. One area of cobot gripper tech that may next see a major breakthrough is in communication. Cobots and humans may work together all day, but in eight hours of mutual toil neither speaks to the other. A voice-enabled gripper and a human could be a formidable working pair, each supplying the other with its own particular expertise and knowledge…moment to moment, if necessary. Then too, there’s something strange about seeing a sleek cobot with its slick, new-age gripper uncomfortably tethered to a teach pendant. As easy to use as teach pendants have recently become, they are, nevertheless, conspicuously old-fashioned…and limiting. To set up a cobot and gripper for a new task, all a human should have to do is say, “Watch me.” There’s no need to yank and gyrate cobot arms into multiple positions to train it for a task. Rather, let the machine watch and learn. And it will! And it will then teach other machines what it has learned. These machines might well discover—completely on their own—a better, more efficient, more productive way to complete a task…and then teach back to the human. All that watching, all that learning, all that teaching others, and all that discovery will reside in a smart gripper. Look for the teach pendant to quickly become the odd-man out; a casualty in the quest for the smart factory in Industry 4.0. And as a replacement, how about a voice interface and Augmented Reality (AR)? A recent issue of Electronic Design goes right to the heart of it: Cobots and Augmented Reality are Changing the Factory. Cobots and AR could revolutionize how industrial systems are designed and run. Imagine a human worker and a cobot starting every shift together with a quick meeting, each speaking to the other about the job ahead? Imagine the human using an AR headset to map physical and digital product characteristics utilizing a digital twin to fully understand and predict the products behavior, something like Scope AR’s WorkLink? Imagine a “smart” cobot gripper feeding production information to the human’s AR headset, with the same gripper reacting instantly to the human’s voice instructions? Imagine AUTOMATICA 2020 with all of that cobot/human interaction taking place everywhere across the show floor? Attendees interacting with expo gear through speech…and expo gear responding. Humans and machines chatting together, intelligently. Exciting things are coming. And it’s only two years away.